Perhaps a middle ground then? CGI rendering has come a long way since the days of KM and it's now possible to create 3d realms but still give the final image the feel of anything you wish. 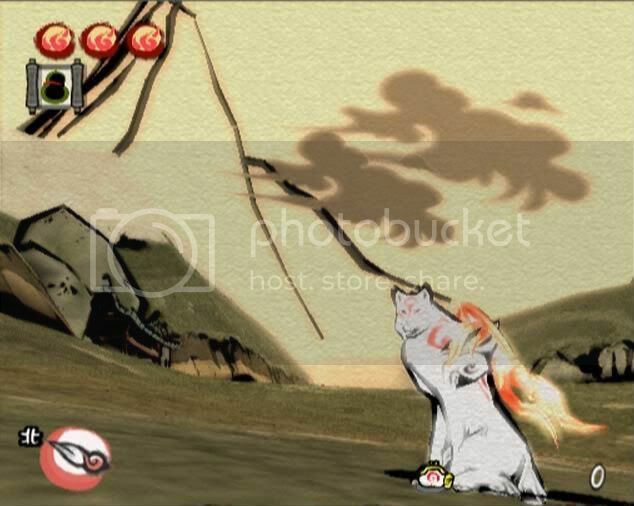 The PS2 game "Okami" would be a good example. The game is free-roaming 3D but is rendered/filtered to make it look like a Japanese painting on heavy canvas. The thinking being to continue using CGI (probably a given anyway) but render it in a way to keep the original David Rowe feel that many are fond of. The big thing I always found with the later style of KM is that the program was trying too hard to be "real" and lost that "suspension of disbelief" edge of the earlier series. Like I've said in the past, early KM was very "Join us, if you dare" while later KM felt "You are already here". As a viewer I wasn't as intrigued as before to wander in by myself. I was effectively grabbed by the scruff of the neck and dragged into the realm. In a nutshell, don't make the end result too perfect or it feels fake. Keep things very slightly... off... and that old feeling of terror when a team messes up would return with a vengeance. Snowcat wrote: Perhaps a middle ground then? The graphics in that game are gorgeous, though, one magazine said that screenshots could do the graphics justice, provided they were hand painted in ink on said heavy canvas. The way you get that sort of effect is by applying a post-render filter, I believe. Depending on the filter determines the effect, but all cell shading (And all Okami's graphics are are an especially pretty cell shade) uses filters of that nature. Personally, I preferred both the Rowe art and the CGI to the colour-adjusted castle photographs. The problem with using CGI in something like Knightmare, though, is that CGI looks worse when placed next to real people, and for some reason the more realistic the CGI is the worse this effect is. (And the more organic what's being rendered is, the worse the effect is). I seem to recall it being referred to as the uncanny valley effect? Which would seem to indicate applying some sort of post-rendering filter might be a good idea. Then again, it is possible to create photo-realistic artificial environments with CGI, and I've seen wonderful things done with still images of tree trunks using algorithmic techniques. I've just never heard of it being done live (which isn't to say it isn't possible) or on a gameshow/children's sized budget (...Which is to say 'oh dear', given that whatever budget Doctor Who has for it's CGI environments creates a sort of hit and miss result). Someone who has far too much time and money should make "Knightmare Remastered" - drop the CGI style graphics from series 8 into the first three series. Then sit back and wait for the screaming apoplexy. Does this all sound familiar? It should, because most will be aware this had been tried and tested on the first three series of Red Dwarf... and the remasters all went down like a sack of cold sick. The Red Dwarf "additions" did feel hellishly unnecessary. I suppose the idea here is to balance the original feel to keep the "Old Guard" like many of us entertained while also making things modern enough to bring in new fans and folks who may not remember the original. Personally, so long as any "remake" or evolution isn't dumbed down like practically every random/generic "Phone to vote someone off" type crap I'll probably watch it regardless. -'Personally, I preferred both the Rowe art and the CGI to the colour-adjusted castle photographs'-. ..and so did I, but we were desparate to get more movement into something that was looking increasingly static. Robert Harris's ability to overlay David's artwork with a black stencil, and then airbrush through to create different lighting effects, helped with atmosphere, but things were still too static. Perhaps we'll know some of these answers soon? beveryafraid wrote: -'Personally, I preferred both the Rowe art and the CGI to the colour-adjusted castle photographs'-. The David Rowe- style paintings could be used as textures in a computer-rendered dungeon, giving you both the moveability and the atmosphere and style of the original (which was far better than anything that came later IMO). Obviously this wouldn't have been possible at the time, at least not without spending ages pre-rendering, which is little better than static, but would be easy enough now. I might try it out with some of the existing rooms some day, just out of curiosity, if I can work out how to. Add in some CGI monsters, but keep a few real characters to allow better interaction with the dungeoneer, and it would look great. I think some of the backdrops which featured in series 3 were quite good. The cave backgrounds didn't seem like they were drawings, yet I don't think they were CGI (or at least based on the corridors featured). Compared to the CGI in series 8 I think as previously mentioned computer graphics have come a long way since then. Whilst I don't think they could be made to look completely 'real' if a quick turnaround is required I think they could at least recreate the hand-drawn style rooms. Something most definitely appears to be stirring. I'm intrigued! Ariadne's Layer wrote: I completely agree except for me I could tolerate s4-7 because the outdoor locations used real photographs of ruined castles so as a child you could still believe they were really standing there, whereas series 8 was undeniably fake even to a child, felt like they were in a computer game. This is something I've always felt. The outdoor locations were new, completely different (and yes, were not as impressive in a visual sense as David Rowe's artwork) but they gave you a sense of excitement that the locations were places you could go to. The colour adjusting sort of gave it an unusual touch too - which was what was needed to make you feel the dungeoneer was travelling in an otherworldly place (many may disagree). I think the eyeshield sequences perhaps overemphasised the outdoorness of it all, and that along with the massive change from s1-3's great hand drawings is what has facilitated this grand debate. I think what this discussion shows is what was so great about the concept of knightmare - the 'dungeon' was never really defined or restrictive in terms of places and routes. What I currently think is, the mystery remained by the aforementioned visual changes. I'm sure if there is to be a next phase - it will be new visually, as it should be. Onward not back . And as everyone on this forum would probably agree anything KM related happening is good news not bad news. Kids need inspiring again! beveryafraid wrote: ..and so did I, but we were desparate to get more movement into something that was looking increasingly static. ...So, the ideal would be something along the lines of the Rowe art but with the ability to move the camera, go for close ups, etc? Out of curiosity, would applying a matt painting to an outline CGI model like, I believe, The Mill do for some of their Doctor Who work be able to do that? Yeah, that's what I was thinking. No going back but not jumping TOO far forward (Nice way of putting it 123pooka ). "Virtual Set" (IE entire room blue screened with motion tracked cameras) setups aren't the latest but would work perfectly in a situation like this. Because it uses existing technology as well, there'll hopefully be less of the technophobia that dogged KMs development in the past. Evolution rather than Revolution. Knightmare and its formula won awards and gained the following it has for a reason and there's little need to mess with what works. Merely spruce it up a little for the modern audience but keep it old skool. It seems that there's all kinds of remakes, revamps and "reboots" of old classic series happening these days. Most keep quite close to the originals for a while before developing characters beyond what we knew of the original. Maybe that would be best for KM? Give us a "Modern" series 1 with all it's back-to-back dangers and then develop much like the first run did? Snowcat wrote: Yeah, that's what I was thinking. No going back but not jumping TOO far forward (Nice way of putting it 123pooka ).